As mommy of 2 and with a baby on the way I've had a hard time trying to remember all the essentials for my nursery. There are so many new things I want I mean need and so many old things that we loved and worked great with the 2 eldest. While making the list: the first 3 items were: crib, diaper-change station and a humidifier.Yes a humidifier we use one in every room for fall/winter and since i'm asthmatic my humidifier works 365 days in a row. I was blessed with the opportunity to review Hello Comfort from Crane, not long ago I posted a review for Crane's nightlight. I'm still crazy about their little hippo. Both of my kids were raised with a humidifier or vaporizer in the room, I keep my babies with me for 3/4 months in their own bassinet. My 2 eldest were born in September and August, and their first winters were harsh, but we never actually had big problems with colds,croup or sore throats and it's mostly because be always had a humidifier in the room. When I was 10 or so I would have terrifying asthma attacks and some of them were at night, if you're asthmatic you know how scary it can be to wake up in the middle of the night feeling the tightness in your chest, the short breaths, coughing or the complete lack of air, it can be really scary. My family doctor recommended my parents to place a vaporizer in my bedroom and for the first time in years I was able to sleep the whole night, within a few years we changed it to a humidifier. To be honest until my nephew was born 4 years ago I had no clue how great humidifiers were for newborns and for children in general. My kids always had their humidifiers working in the winter to avoid congested noses and dry skin, but my sister pediatrician was kind to explain to us how humidifiers were also effective and widely used against the common cold in children under 6, since most pediatrician do not recommend any kind of over the counter medicine for children under 6. They will recommend only a humidifier and saline nasal solution. A humidifier will help to reduce cold symptoms and the humidity will actually reduce the survival of the flu virus in the air and surfaces, since newborns will only breath by their noses till their 6th month of life a humidifier will help to prevent dry stuffy noses or loosen the nasal congestion and soothing sore throats while making breathing and nursing more comfortable for your baby. While our princess will not be here for another 2/3 weeks, we have a lovely Hello Comfort (kitty) humidifier already placed in her bedroom. For us a humidifier is a must have at home, also keeping your humidifier clean and functional, most will need a daily water change and weekly water and vinegar deep clean. Stay tuned for our Blu me away or Pink of me Event.. Thanks for reading and visit us often for more baby reviews and to find out what other prizes you could win!!! Thanks for the great info!! I have had asthma all my life and I will be sure to try a humidifier. I love the Hello Kitty one. They sure have come a long way from the blah and drab ordinary designs. Who wouldn't want a hello Kitty on their nightstand. Heck I want one!! LOL Our old farmhouse gets so dry in the winter with the wood stove constantly on the go. would love it in my room. Daw. That's adorable. I love Hello Kitty! Finally a humidifier that's attractive. That is sooo cute! My daughter would love this for sure! We love Hello Kitty items. Definitely, this vaporizer works great for those who have asthma. It's easy to clean as well. I don't know anyone who doesn't like Hello Kitty, she's so cute. Cute humidifier. I have a friend with a little girl--she'd love this. I actually own this humidifier and the warm mist. I just love Crane products because they actually work. How cute! What a great humifier to have in a girls room. I would definitely buy this. Cute design, Hello Kitty for the girls in the house. I hope they have designs for boys. I think I need a humidifier because my boy is complaining about clogged nose. Aww, how cute is Hello Kitty! I never had a humidifier growing up but am considering one now. I have always had sinus problems, especially in the morning. 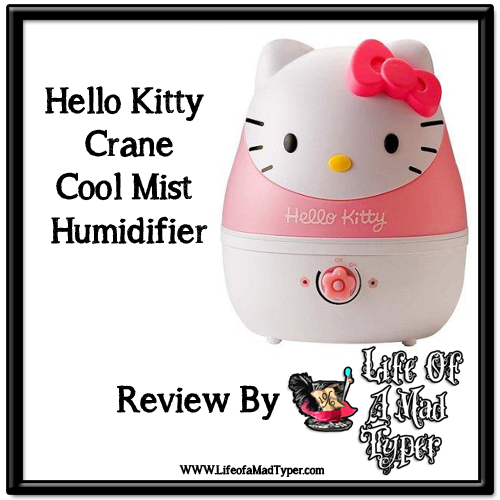 I love these Crane humidifiers and love the Hello Kitty one. Thanks for sharing. That is adorable. I like how they fit the functionality into something fun like Hello kitty! That is a pretty twist to the usual humidifier. It makes a good home accent as well. What a cute humidifier! Kinda makes me wish I had a little girl. I used a humidifier in the winter and it really does wonders for my sinuses. We have cute Penguin humidifier, my son loves it! Works great and my son can turn it on and off and adjust the mist on his own. Easy to clean and I like how we can add a de-mineralization cartridge to the water tank. Doesn't grow mold as fast as other ones we've had in the past. Crane Cool Mist Humidifier Have lot of recommendation and many customer provide humidifier review and thay are most of like it! !